Check out the rescoop of this flavor. My bad experience with Brown Sugar made me a bit too harsh of this one, though the second time around wasn't a complete winner either. After the painful experience with Five - Brown Sugar, I was looking forward to the Milk chocolate flavored ice cream to right the ship. Problem is, apparently the molasses wasn't the only problem with this ice cream. Not sure how or why, but the milk chocolate suffers a similar (though not as potent) dry/chalky texture that I discovered in the Brown sugar. I can tell you right now I will not be buying any more Five flavors (unless someone gives me a fantastic recommendation on one of the other flavors). If you've ever messed around with cocoa, you know it can be very dry and chalky, well, that's what this ice cream reminds me of. I really thought Haagen-Dazs was going to break new ground with just five ingredients but instead we're presented with yet another unappealing product. I just can't think of an excuse to eat it ...though I do suddenly have the urge to try and make a milkshake with it, the added milk might wash away the dry texture. I guess I'm surprised that at a high end company like Haagen-Dazs, the samplers didn't stand up and go "hey, ummmm, this doesn't work for me". Oh well. Update: After writing this I couldn't resist and decided to make milkshakes for my wife and daughter. The milk does help (though it mellows the flavor). I'll probably burn up the rest of the Five ice cream this way. Did you like the "extra rich light" HD flavors that were discontinued last year? I am wondering why "Five" is failing when they have more fat than the Light flavors did... Hmm. Nope, afraid I missed them since I've only recently started sampling Haagen-Dazs again. I'm still in disbelief at how much I DON'T like this new line. Try the Passion Fruit in the Five. I think it may be my new favorite! I used to like Cherry Fudge Truffle and sometimes the mint chip in the light versions. I tried Haagen-Dazs' Five in Mint. Absolutely delicious! You are started out unfortunately with the two worst flavors. If you try the mint (which is HEAVEN on earth) and the coffee and can say the same thing I will truly be surprised! Ive found the coffee and chocolate flavor to be great! Best ice cream ever and I love that it doesn't have the syrup ingredients like a lot of store ice cream does. Didn't like the brown sugar either - its just too sweet, I cant eat more than two bites at a time. Hmm...I just got some of the five brown sugar, and it's great! It's not chalky or dry at all! I LOVE my ice cream, and consider myself to have pretty good ice cream taste. Maybe you got a bad batch? I don't eat ice cream much and when I do, I'm very picky. 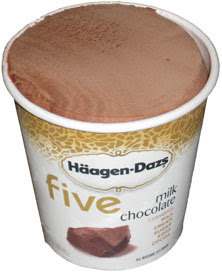 I used to not eat ice at all until I discover Haagen Daz Five Mint. It's my favorite! I used to love their coffee flavor and I still do but the mint is just soooo refreshing. Even my 3 year old tells me that it's his favorite ice cream!